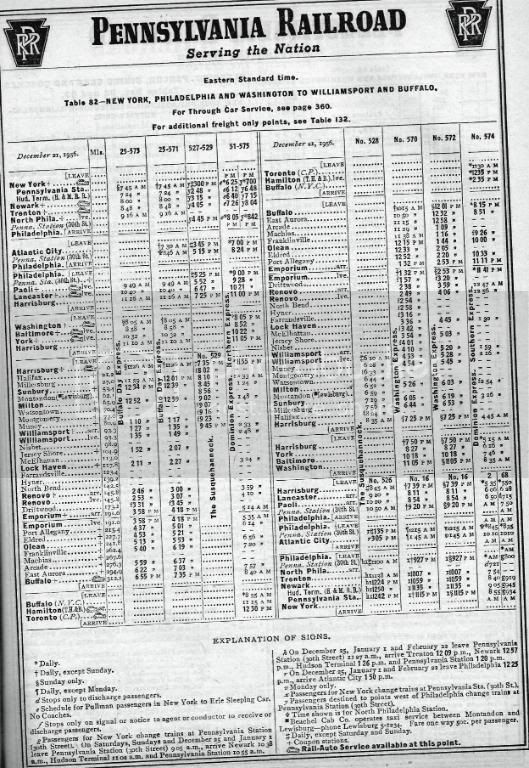 Looking in the WNYP book - they have a published passenger schedule on the Buffalo line (1967) that shows two Buffalo-Washington trains per day - 574/575 "Southern Express / Northern Express", and 570/571 "Baltimore Day Express / Buffalo Day Express". 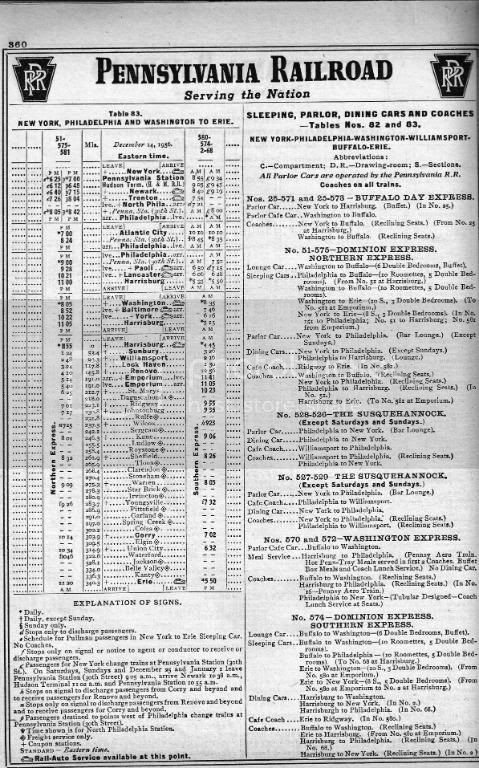 Buffalo to Washington on the Northern/Southern still had a 10/6 sleeper, but the diner only ran Harrisburg-Baltimore-Washington. Book has shots of DOUBLEHEADED M1's at East Aurora; shot of M1 6800 at Keating Summit; 6835 at Buffalo on the "Washington & Philadelphia Express" (1952), 6491 on the "Dominon Express" at Buffalo, so you're safe on that one. In 1980, the D&H ran a pair of trains, WR-7 and RW-6, down the Buffalo Line (which was actually called "Main Line-Rockville to Buffalo" at the time, though Buffalo Line sounds 100x better!). Those always had neat power. D&H ran those trains into Potomac Yard in Alexandria, VA. Used to see the power all the time when I worked near there. Lots of newsprint cars in the consists. Also the New York Central had trackage rights on portions of this line. Good excuse to run a couple NYC trains (I know - there the enemy of any good PRR fan). I may have to use my Kato Broadway Limited consist as an occasional detour over the Buffalo Line (major derailment blocking all 4 tracks west of Marysville?). i don't think the BL would have gone past Lock Haven , so i take it you are going to model the connection with the Bald Eagle Branch? How long will it be before they show us how to add DCC to a tree? Correct in that it went down the Bald Eagle branch. Much as I'd like to model Lock Haven and part of the BE, I think I'm sticking with H'burg to Norry and that's it. Maybe a branch to a mine representing the Shamokin line. Same branch could stand-in for the D&H in 1980. Dave, do you have "Along the Main Line" (Alexander) in your collection? And I've collected some color shots of the PRR Erie-Harrisburg (New York) train 580/581 as it ran through here. Two E-units, baggage, coach, and a sleeper were all that remained at the end (1965). My father referred to it as "The Rattler". I rode it myself once before it was discontinued, in second grade. I have two distinct memories - the smell of the coach, and the guys in the front of the coach passing around a bottle in a paper bag. As this was a school trip, my teacher was trying very hard to keep us on the other end. The conductor made a comment that "this is the most people on this train in a long time" (the 20 of us plus the other half a dozen). Having Bennett Levin's PRR E units up here in 2001 was way cool. Even cooler was the ex-CZ dome car, absolutely the one and only time that a dome was ever used up here! Nope, I'll have to add that book to my wish list! what type of operations do you want? I don't know. I guess lots of run-through with some switching. Really, that's about as specific as I can be. I am THE most clueless model railroader that has ever been when it comes to operations. I have Koester's books on realistic model railroad design and on operations, but still... Imagine the word "DUH" spliced with a jackass bray. That's me.